In Navajo, verbs are the building blocks of meaning. By adding prefixes to a verb root, one can often generate a complete thought. This dictionary provides conjugations for almost sixty percent of all Navajo verbs with English translations. It is arranged in alphabetical order by the verb roots in Navajo and sample sentences of each verb are included as separate listings. 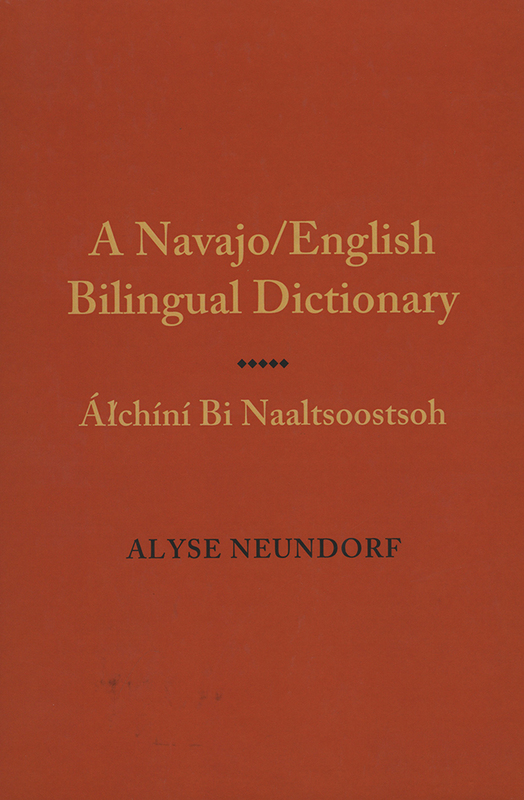 "Alyse Goodluck Neundorf (1942-2004), teacher, linguist, interpreter, artist, writer and a former 'Miss Navajo' was the author of this work on the Navajo verb--the last of her contributions in the field of Navajo linguistics. . . .
Alyse Neundorf received her Ph.D. in linguistics from the University of New Mexico and devoted her career to the study and teaching of her native Navajo. She was passionate about helping students learn to read and write in Navajo, and she taught at UNM-Gallup until her untimely death in 2004.